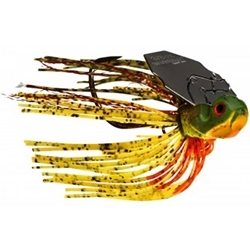 The BOOYAH MELEE is a unique bladed jig that can be fished around wood and grass thanks to the design of the head and blade attachment. the polycarbonate head contains a lead core, which creates a distinctive sound when it is struck by the blade, which has a thin diameter for added vibration and action. The Melee is designed to stay down in the water column, unlike other bladed jigs that rise as they are retrieved. a long-shanked hook and wire keeper make sure your trailer stays secured to the Melee. This is definitely a bait you'll want in your arsenal on game day!